Bayley had recently posted a picture on Twitter that addressed Becky Lynch, with The Hugger stating that she and Banks enjoyed Becky's match. Lynch replied in her own unique manner, saying that she would love to slap Bayley's head off. Becky Lynch won the WWE Raw as well as SmackDown Women's Title at WrestleMania 35, by pinning Ronda Rousey in a controversial finish. Sasha Banks and Bayley didn't have much luck though, as they lost their Women's Tag Team Titles to The IIconics in a Fatal Four-Way Tag Team match. The Boss 'n' Hug Connection apparently watched Becky win the title in the main event of the show. Bayley and Sasha Banks are in the midst of a major controversy at the moment. Several sources have reported that the duo threw a fit after losing their titles at WrestleMania. Additionally, Sasha proceeded to unfollow WWE on Twitter. She didn't stop there though and went on to follow All Elite Wrestling. Recently, Bayley posted a photo of both Superstars enjoying the main event of 'Mania. Bayley wrote that they loved Becky's match, to which Becky was quick to reply. Lynch had earlier challenged Sasha Banks to a fight by addressing The Boss on Twitter. Now, she has set her sights on Bayley, and a possible feud between The Man and The Hugger in the future can't be discounted. Becky Lynch is currently feuding with The Lady of WWE, Lacey Evans. The duo is set to face off sometime in the near future, with the ideal spot being the upcoming Money In The Bank PPV. What are your views on Becky Lynch's reply to Bayley? 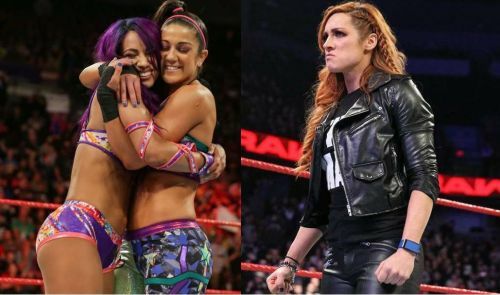 WWE News: WWE Superstar responds to fan calling Bayley and Sasha "spoiled brats"